This Double SUP Stand makes storing your paddleboards easy, especially if you've got a lot of boards. Load 2 boards up horizontally onto the rack's padded frame, and you'll have your SUPs ready to paddle whenever you need them, no setup or installation required. And it's fully portable, so you can move this freestanding rack wherever you're storing your SUPs next. 2 SUP Storage. With double the SUP storage capacity, this rack (or a few of these racks) is great for paddleboard enthusiasts with multiple paddleboards. It's also great for stores or shops using and storing their SUPs during the day, like SUP yoga studios, SUP rental shops, SUP schools, and paddle expos. Indoor-Outdoor Storage. The frame of the rack is made from heavy-duty T6 6063 Aluminum and the hardware is stainless steel, so the entire rack is rust proof - a must for any quality SUP rack. This means you can use the rack in your garage and move it in your backyard, or on your dock or deck when you want to move your SUPs. For retail use, you can display your paddleboards outside during the day and bring the racks and boards back inside at night. In windy outdoor conditions, holes in the frame's base allow you to anchor or stake the rack to the ground for stability so your SUPs don't act as sails. Portable. No mounting or installation is required for this floor stand, so set it up the first time knowing you can move it to wherever you need it next. From your garage to your deck, to your dock, to your shop, to your basement. Simple to Use. Load the center of your SUPs gravity in the rack, and face the boards outward if you need to accommodate long fins. No straps or tie downs are required for storage. This rack is also available as a SUP Cart and Stand combo. Want to lock up your paddleboards and your Stand? Check out this SUP Lock system. Hey! This is Josh from StoreYourBoard, here today to talk about the 2 SUP Stand. Here it is in front of me. It’s a really great, affordable, very useful freestanding rack, so it moves around the whole two of your SUPs outwards right in front of theses slots right here. They go here and here. Each of these widths is 7 inches, so that should hold a majority of paddleboards on the market, and it’s your recreational, your touring, your inflatables. If you have a very, very thick displacement race board, it might be a little thicker. Just make sure you measure. Make sure it’s 5 or 7 inches, so it fits nicely. Like I said, here is the rack here. It has nice heavy-duty foam pad to protect those board edges, give your board a nice hold. It comes like this. It has a little bit of self-assembly required. It’s very easy to snap together. We have a couple of angled points on the base. If you’re going to use it inside, in your garage, your basement, in your house, you really don’t need to anchor it. It’s pretty stable by itself. It will fit two boards and hold them. We also recommend them for outdoor, so you can use it on your deck, or your dock, in the grass, wherever you need it. It it’s calm, if it’s a nice, flat level place, you don't need to anchor it. If it’s windy, if it’s a little bit off level, we definitely recommend you anchor it, so it has a couple of if you’re going to do wood or something like that, you put some screws in there. If you’re in grass, you can do something like stake to really anchor it down. It’s a super simple rack, but it’s great. Customers love it. A great way to store two paddleboards. It also comes with a strap. It gives you want to kind of lock in the boards a little bit better, make them nice and secure if you’re going to be away for a bit and will it keep it like that. So, now to show you. We have two paddleboards behind me. We’re going to put those in for you, kind of show you how it goes. One thing a lot of people ask is when you have two boards with the fins, it’s just usually easier to point the fins out away from yourself. so your board will be here and your fin will come out. That way, there is interference between them, so you can get that full set in each width and there is no interference between them. You can use your board with your fins out, but most people like to keep them in, so it’s ready to go whenever they want. I’m going to move it little bit backward first here. When you’re loading it, you want to kind of keep it centered, so a good way, most paddleboards have angled grip that’s pretty much right in the center of the board. You really want to keep that right in the center of the rack, and you can see it. it just really stays very nicely. Easy as that. This is the back end. You can see the fins. You can’t see them, but the fins are towards the back, so I’m going to put one more board here, just like that. So here you can see the fins are out, so there it is: two SUPs, two paddleboards, very tightly compactly stored, and very nice freestanding rack. Check it out today at StoreYourBoard.com! Do 2 12'6 touring boards work with this rack? Our 2 SUP stand fits all SUPs that are up to 7 inches thick. That depth accommodates most SUPs. Since racing SUPs are sometimes quite thick, its something to be aware of, though most likely should be fine. The length of your boards should not be a problem; this should be a good option for storing them. Is it stable with just one SUP on the rack?? Yes, our two SUP stand works well even when you just have one board on it! It is a very stable stand. Can 2 boards with the fins attached fit, or do the fins need to be taken off before storing? Yes, you can leave your fins in the boards. The easiest thing to do is just put your paddle boards in the stand with the fins facing out (away from the center). That way you don't have any clearance issues or run the risk of the fins hitting your other board. Does this work outside in windy conditions? In very windy outdoor conditions, you may need to anchor or stake this SUP rack to the ground for stability, so your SUPs don't act as sails. The stand has some holes in the base, that can be used for securing/staking purposes. Do you sell the stakes for stability? Stakes can be used for extra stability with this 2 SUP stand, and purchased from anywhere you buy hardware. We don't currently have any available in our listings. Our two board stand can support fairly long SUPs or Surfboards. At 11' and 10'2" long, both of your boards should be fine on this. You'll have about 4 feet or a little more of your boards hanging over on each end, but they should be stably supported by the base of the stand and should work well. How tall is the rack with 31" width boards in place? This SUP stand will raise your boards about 11" off of the floor, so you would add a little less than a foot to the width of your SUPs to know how much space it would take up in height (so, about 42" in the case of your 31" wide boards, or about 3.5 feet). The stand itself, without any boards on it, is 34" at it's highest point. I had mixed feelings about the rack when I started taking the partsout of the box and putting it together. The finished result has won me over, i’m a typical wall rack guy for surfboards and sups. It’s such a small footprint, but it really looks good and works well. I was worried the boards would be to heavy for the rack, thus making it tip over. This rack is $ well spent. The Stand is well built, easy to put together, and allows me to store my paddleboards in my basement in the winter using a minimum amount of space along one of the walls. Love it! It’s perfect for both my garage and camping. It’s light and versatile for easy transport. Works great,easy to put together and compact!! We're so happy with the double SUP stand. Keeps our boards sturdy and organized so they're not laying around in the yard. Well made, takes up minimal space, and goes together without a flaw! The stand even anchored is very tippy! Your paddleboard rack is perfect!! We made a pvc pipe one that couldn't hold the weight and fell apart after one season. I was worried it would be cheaply made but it is not! The only thing that would be better is if we could store a canoe or kayak on top. they are just what we needed to store the two sup inflated on the dock. Placed this on a dock. Excellent at holding the boards. Only nit noy is that the dock is synthetic planking which makes for a slightly slippery surface if not bolted down. Mine is not intended to be. A good gust of wind will absolutely move the whole set up around. Pondering ways to secure it without putting holes in the dock surface. Good buy and price. My only complaint would be that if storing outside the wind may knock boards together. I placed some foam "pool" noodles between the boards and the stand so they won't bang up against each other on a windy day. I do have it secured to the ground with ground anchors and heavy duty zip ties. I use this outdoors on the shore of our pond. I like that it is portable and I can move it to wherever I want to store the boards. It is very easy to assemble and easily holds my 2 paddleboards. Each one weighs 50 pounds! Exactly as it was pictured and described on website! The rack appears to be well built and it was easy to put together. It is lightweight and very versatile. The boards are stored on the rails and this saves some space in our garage. Just exactly what I needed for my boards, and fast service...very happy. We have two SUP's and have always had a challenge storing them in summer as we live on a lake. They sit on the shoreline and are ALWAYS in the way. This rack is perfect. The only thing I would change is to reinforce the area for the stake to go into the ground so the hole could be bigger and accommodate a bigger stake. I am a bit worried that at some point a strong gust of wind may loosen this holder up and hurt my board. But...it has not happened yet! Exactly what I was looking for. I bought it not just for racking the boards but primarily to hold them when I wash them after a session. I can wash both sides plus the water drains down without having to flip the boards when I had them on regular horses. Makes it a lot easier to maintain and clean in this manner. We are using this rack to store two paddleboards outside in very windy conditions. With stakes in the stands, they have not budged an inch. Easy to put together and simple design. Highly recommend! Easy to assemble. Protects my boards and saves room in my garage. Rack holds boards perfectly even in a stiff wind. No corrosion evident with the rack directly on the ocean beach. Great product! Great rack, we plan to order another one next summer when we get back to NH! Excellent service and delivery. Takes about 5 minutes to get the rack ready for the paddleboards The racks are lightweight, sturdy and well made. We purchased these for use at our condo association and they fit in perfectly. Very pleased with this product. Would highly recommend this product. Works great. Freed up a lot of space in my garage since I had my custom built 8'11" x 31" x 4" @ 140 liters Sup Sports "Hammer" model surfing sup stored horizontally, deck pad side down, between two sawhorses. I was pleased to find the SUP Rack for my boards. Very sturdy construction, with a small footprint, providing a safe, stable support storage for my boards. This is a great Paddleboard rack and being made of anodized aluminum tubing makes it a high quality item, yet light weight to make it easy to handle. My one suggestion and desire is that it would be a folding design instead of assembling it with manual pins and push button so it would fold-up making it more compact for transporting. Great solution for SUP storage! Written by: Robert Alan S.
This thing is great! Easy to assemble. Portable, which is important because it will do triple duty. It is storing my board indoors for the winter in our bedroom at our cabin in west-central Wisconsin. Next summer, I plan to use it in our shed (we share a 5-family cabin), and also outside while the board is in use. And I'm planning to purchase a second board next spring. Yay! I love how it looks. Seems to be of good quality and sturdy. Fair price. I'm looking forward to next summer already. I think this was a good solution for indoor winter storage for me. First year SUP user with a very steep learning curve, but it is heaven out on a glassy lake at 7am with loons calling. Thanks!! Use it for indoor storage and it's perfect. Very strudy and stable even with one board on it. Take it outside to hold my board while I hose ot down and clean it...works great. Definitely would reccommend. Easy assembly. The items I ordered from STORE YOUR BOARD were purchased as gifts for my son and his fiancé. So far they have been very pleased with the 2 board stand and the SUP locking cable with 2 'locking keys'. Will be of great use for the old man to store his boards off the ground. The stand is easy to assemble and securely holds two boards. We will move it into the garage for winter board storage. Written by: G thomas M.
This stand was very easy to assemble and is quite sturdy. The stand suits my purposes very well. I have a small cabin at a communal property in NH. The walk to the lake from my unit is a steep hill so I can store my board in an out of the way spot by the lake and also take it with me when traveling to other locales. The Stand up Paddleboard Stand is great for protecting the boards and minimizing the space requirement. However, i needed to build a stand for the rack to keep the wind from blowing it over. This was the perfect solution for storing our two paddle boards. We used tent stakes to provide extra security in the event of wind and had no issues whatsoever after several very windy and rainy weekends. It was also very easy to assemble - less than 5 minutes! The box did not include the padded separation bar which goes on top of the unit and separates the two boards. I sent you an email about this last night and so far no response???????? Just as described and pictured, I need a place to prop my racks when not storing them inside. Product is easy to assemble and performs exactly as hoped. You could also attach this rack to a dock instead of buying the dock storage option. Definitely a fan. Everything was as decribed, easy to assemble, came on time and is a perfect fit for us! Highly recommend! It's very easy to move around. In winter it can be put in garage and we don't have racks hanging on our fence. Works excellent. It's exactly what I needed to store my boards by the water. Easy to assemble...even for an inexperienced woman! The SUP rack is a little light weight to hold the boards as the wind comes up in the afternoon. 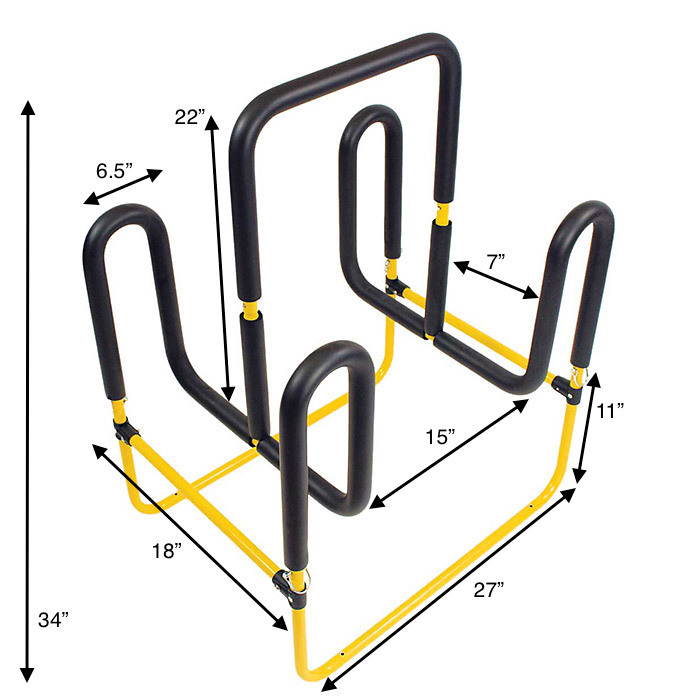 Making the rack a little heavier and sturdier would be beneficial. The rack was easy to assemble. Only issue is in windy conditions it tips over pretty easily so anchor it down or it will fall over. Works great otherwise. Written by: Mary kae C.
I am so happy that I found this paddle board rack. We put it together in about 10 minutes and it is the perfect solution to our limited storage space! This is a great storage unit for our 2 paddleboards. Great price! This was a gift for my son-in-law. It fit perfect in their garage!! Now they can also park the car in the garage. Easy to assemble and doesn't take up much room. I like to store my SUP in the backyard during paddle season. This gets it off the ground and avoids leaning it on anything. Easy assembly, sturdy and stable, and takes up very little space. A great value! We love this stand. It is very stable even with one board. It is lightweight so it can be put on the beach when using and then move indoors for storing very easily. The 2 SUP stand was purchased for a friend who has a house in Mexico. The boards were being stored on foam to keep the boards off the concrete floor. The building materials were suspect for wall mounts. This product makes it easier to keep the boards off the floor! easy to put together and is perfect for our boards. This is exactly what we needed to store our SUP! We are using the other side to store numerous boogie boards. PERFECT! My boards were just laying outside on furniture & drove me crazy. They are now stored in this awesome stand on the side of the house that took minutes to assemble with no tools (I think.. I was actually drinking a beer & watching my boyfriend assemble it) The rack was delivered promptly and well packaged. It holds our 10' boards easily with their board covers on. Needed to store 2 paddle boards outside. This rack did the trick. I would recommend this product. During assembly, I noticed one of the plastic fittings designed to hold the frame together was slightly cracked. I called Customer Service and the next day a replacement part was on its way to me. I'm very pleased with the rack and can highly recommend the customer service. Great storage for both SUP boards. Not only does it look nice it take very little room. Only negative thing I can say is I would have appreciated it already being put together. I bought this rack for quick storage near the dock. Works great and protects my boards! Easy to assemble. Holds my two monster SUPs. Great to have my boards in a rack instead of strapped to the basement ceiling. Great customer service. A plastic piece broke during assembly, but cust. service was quick to send a replacement part. Happy, especially for the price. Stores both of my Boardworks Kraken 12'6'' sups. Perfect storage for 2 boards! I was looking for a low-cost way to store 2 of my boards outside. This was perfect! Easy assembly, solid construction/design, great product. Great service as always. Excellent product for washing boards. Works great, easy to assemble and arrived on time. Can't ask for much else! The perfect product I was looking for. Super easy to set boards in and stable enough to hose off salt water. Feels well made and the padding saved my boards from sitting on the ground or getting scratched. Would highly recommend. Great for two boards. Easy to set up and good construction. Shipping was quick too. Perfect storage for garage for my 10'6 SUP and my 7'10" surfboard. Looks exactly like photos. Easy to assemble. Highly recommend. The rack was exactly as described and looks very nice! If you want this rack to work properly, it needs to be fastened to a base or to a wooden frame. Thankfully there are holes there for the wheels to attach so its easy to use those holes to screw it into something. Otherwise, if its not sitting on a perfectly flat surface and lifting one board while the other isn't perfectly balanced, it tips over. This rack is perfect for us. We have two big 11 foot, 6 inch SUPs, and the rack fits them perfectly. we have had 2 SUP's laying on the floor of my garage for the past 2 years, they obviously get in the way, we saw this product and thought we would give it a shot. Easy to put together and performs as advertised. Perfect for all my SUP quiver!! unfortunately, this product doesn't perform the way I expected it to...it's lightweight and when the wind picks up the 2 boards it is supposed to hole topple over and get damaged. I spent over $100 on a product that doesn't satisfy. It puts together easily. That's all I can really say at this point. This product was easy to put together, and does the job of protecting my board. Highly recommend the product and StoreYourBoard. Thank you very much! I am completely blown away by the quality of this product!!!! Perfect for keeping my prized possessions safe !!!! Exactly as described and very easy assembly, really 5 minutes tops!!!! So great I have bought a second one!!!! Thanks.